NOTE: This is my second attempt to type this. I had a whole post finished this morning that I saved on the blog and wanted to come back to and edit, only to discover that there was an error and my text vanished. Hopefully I haven't forgot any crucial details in my second pass. 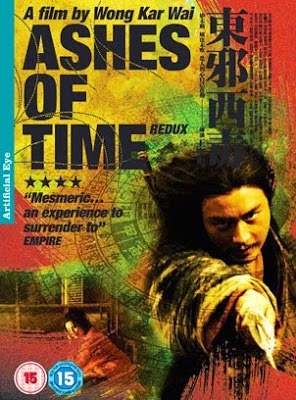 Ashes of Time was originally released in 1994, directed by Wong Kar Wai and featuring an all-star cast (Leslie Cheung, Brigitte Lin, Tony Leung, Carina Lau, Tony Leung Ka Fai, and Maggie Cheung, Jacky Cheung, and Charlie Yeung). Sammo Hung did the action choreography and the story is loosely based on Louis Cha's The Legend of Condor Heroes. In 2008, Wong Kar Wai remastered the film, altering both the score and much of the content. This is a review of the 2008 redux version. Ashes of Time is surreal and difficult to describe because it is told through a series of conversations and narrations by the main character without always providing a clear context. Sometimes the characters speak past one another, sometimes their identifies blur and fade, occasionally things crystalize but this is a film you are meant to feel and experience more than follow. It is a bit like drinking too much wine but on an occasion when that is precisely what you need to appreciate the experience. Normally I provide a detailed overview of the film's plot in my review. Ashes of Time is unique because it is quite difficult to pin down a linear flow of events. There are characters, there is conflict, we are even given an indication of the flow of time through title cards revealing each season (though it is unclear if this is literal or figurative), but it moves more like a dream than a plot. However the movie does contain a clear storyline that frames everything else, a simple love tale that threads through the movie. It begins with Ouyang Feng (Leslie Cheung) who is a kind of broker for people needing hired swords for help or assassination. 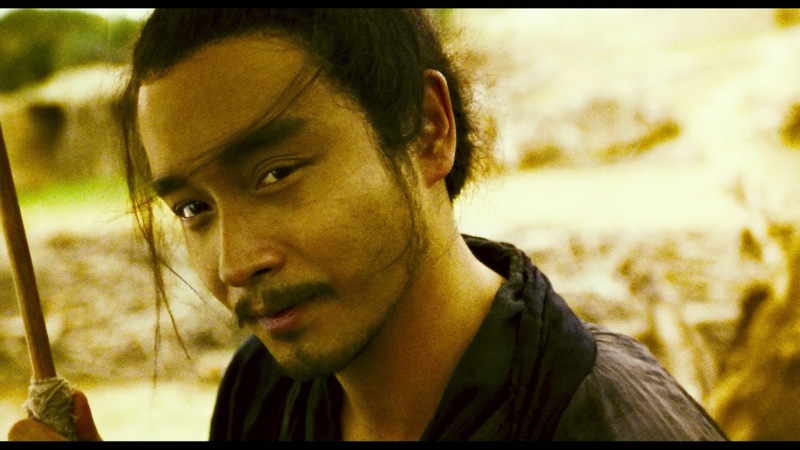 He lives in the desert and once a year his friend Huang Yaoshi (Tony Leung Ka Fai) passes through and visits. This time he arrives but has a magic bottle of wine that he says was given to him by a woman. According to Yaoshi the wine makes you forget your past and therefore eliminates suffering. He offers Ouyang Feng the wine, but he refuses, so Yaoshi drinks some himself and over the course of the evening forgets his past. He then sees a vision of a woman in red and follows, leaving Ouyeng Feng alone. As the film unfolds, Ouyang interacts with several characters, most of whom Yaoshi also has some dealings with. 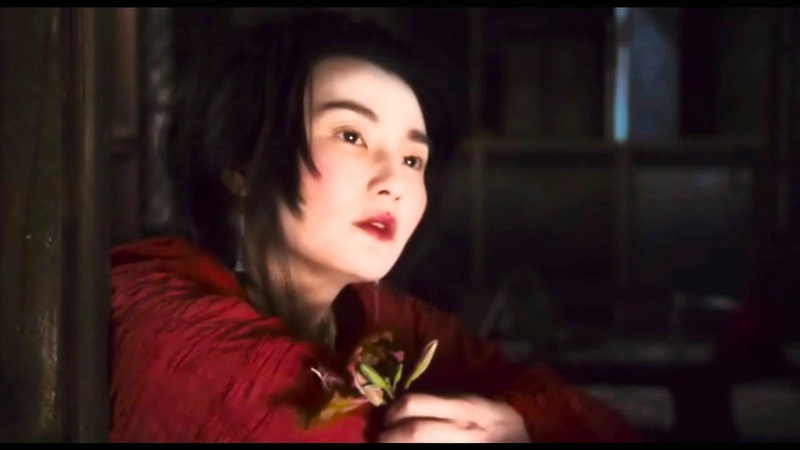 For example we meet a strange brother and sister Murong Yang and Murong Yin (both played by Brigitte Lin). Murong Yang gets drunk with Yaoshi in a tavern and Yaoshi, who seems to admire Yang's appearance, says he will marry his sister if he has one. At the appointed date, Yaoshi does not arrive, so Yang comes to Ouyang to hire him to have Yaoshi killed. This is complicated when Murong Yin also tries to hire him to counter Yang's offer. It becomes clear that this is not a normal brother sister relationship, that Yang is obsessed with Yin and doesn't want anyone to have her. Eventually it is revealed that Yin and Yang are the same person with a split personality. Ouyang Feng cannot tell Yin or Yang apart, but at some point during the night, one of them seduces him, and this serves as a means for us to learn a bit about Ouyang's own past love. Through these interactions (and interactions with other characters), we come to understand Ouyang's history. When Murong Yin/Yang seduces him in his bed, Ouyang says it reminds him of his brother's wife, giving the first hint of a love story that threads through the movie. Later Ouyang meets a young girl with a mule who begs for his help to fend off local militia men, a swordsman who is progressively going blind (Tony Leung), and an assassin named Hong (Jacky Cheung) who is torn between his wife and living an independent life in the martial world. Hong has left his wife behind, yet she follows him. The Blind Swordsman has also left a wife behind (for more complicated reasons explained below) but instead of following, she has given into despair. As Ouyang speaks with and about these figures against the backdrop of a looming bandit attack, he reveals that his former lover (Maggie Cheung) left him for his brother because he, like Hong, neglected her for the outside world. It is only when she marries his brother, that Ouyang realizes how much he loves her and wants to be with her. 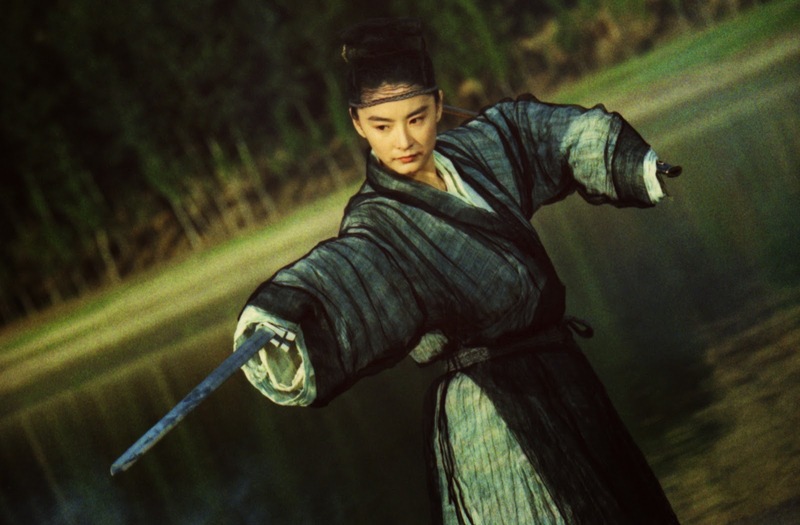 Yaoshi has his own complex relationship with the the Blind Swordsman's wife, Peach Blossom(Carina Lau). He seduces her and this is what creates a rift between Peach Blossom and the Blind Swordsman. 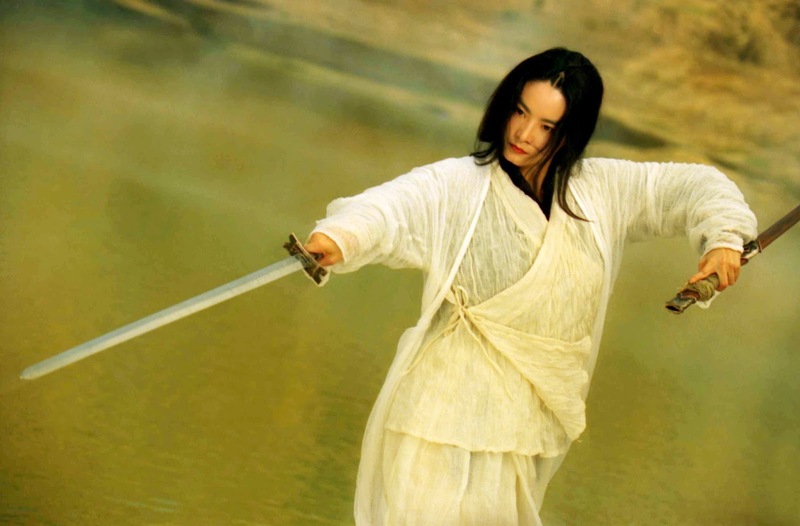 Ultimately Murong Yin/Yang uses her dual nature to become a great swordsman by training against her own reflection, Hong realizes he can take his wife with him on his travels as there is no martial code against the practice, and the Blind Swordsman and his wife Peach Blossom (Carina Lau), are only reunited, in a sense, after his death. After he leaves, we learn that Hong eventually becomes Hong Qigong, the the nine-fingered leader of Beggar Clan (and we do learn in Ashes of Time how his finger was lost). The film ends when Yaoshi explains that the bottle of wine from the beginning of the movie was given to him by Ouyang's brother's wife, and Ouyang receives a message that she died soon after. Here we also learn that Ouyang was an orphan raised by his brothers (significant since he longs for his brother's wife) and has protected himself by rejecting others before they can reject him. He tries to forget his past by drinking the magic wine, but laments that it only heightens the pain. Yaoshi departs to live on Peach Blossom island as the Evil East and Ouyeng becomes the Venomous West. Overall, I enjoyed Ashes of Time Redux. 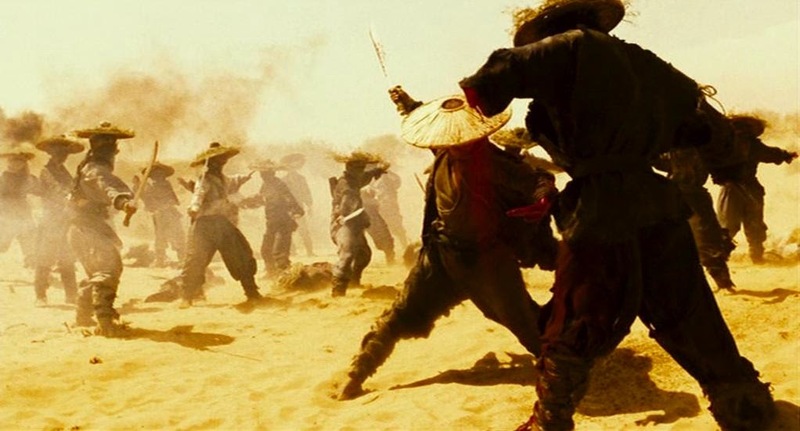 It is surreal and lethargic at times, but it draws you in, and while it doesn't have a lot of action, the fight sequences are a splendid blur of motion that work for the style of the film. I am certainly not the best person to attempt an analysis of a film like this. I can talk about martial arts choreography all day long, but taking a critical lens to movies just isn't in my wheel house. Still I think given the nature of Ashes of Time, I have to attempt to break down some of its pieces here. The movie is based on Legends of Condor Heroes, but this is more of a prequel that uses origin stories of characters from the book to explore ideas of interest to the director. I think it is interesting that he chooses for his focus The Venomous West and the Evil East. Both can be described as villainous and so it seems by explaining how they became that way through their pasts, he is tying in with a Buddhist theme from the opening credits of the film: The flags are still, the wind is calm. It is the heart of man that is in turmoil. That both Ouyang and Yaoshi attempt to free themselves by forgetting their past is striking when you realize who they become. In the Legend of Condor Heroes, Ouyang is a terrifying foe, and Yaoshi is the cruel and intimidating father in law of the story's hero. This is an aspect of the movie I found myself thinking about a lot. There is much going on, and I would be lying if I said I understood the movie in terms of its overall meaning. I can tell that identity is important. You never quite know when one character ends and another begins. This is most visible in Murong Yin and Murong Yang, who we learn is literally a single person with two identities. But there are hints that she isn't the only one. At times you wonder whether Ouyang Feng and Huang Yaoshi are the same person, or if Ouyang Feng and his brother's wife are the same person. After a while, everything blends so much, you start to believe all the characters in the film are actually just two people who are themselves really just one separated by an illusionary line. That the Murong siblings are named Yin and Yang is clearly deliberate, and I think that is an overall theme of the movie. 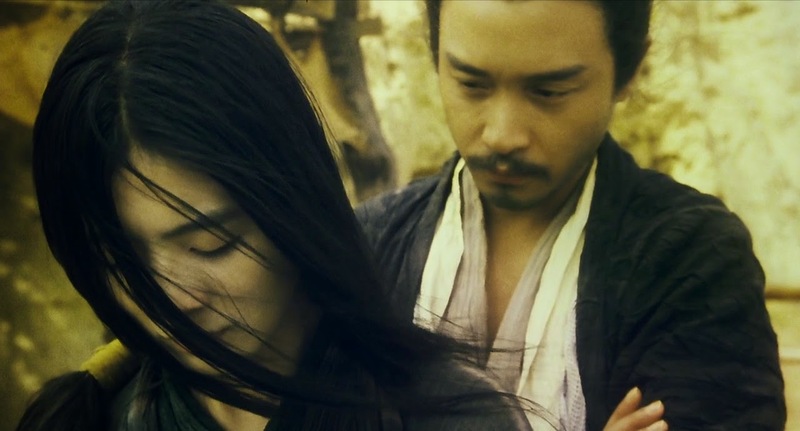 In the end, at least to me, it seems to be Ouyang Feng and Huang Yaoshi's inability to reconcile these two halves of themselves that causes them to become the great evils of Legend of Condor Heroes. Ashes of Time definitely benefits from familiarity with The Legend of Condor Heroes. I think if I didn't realize who Ouyang Feng and the others were, I would have been quite lost. But knowing their future roles helps give some important context. The director certainly takes a lot of creative liberties, and I am sure folks more familiar with the original material by Cha would possibly take issue with some of his inventions. Personally, as someone who has encountered Legend of Condor Heroes through a few of the television series, I liked that he took the character's pasts as his starting point, but seemed to be focused on creating something new. The swordplay is good but obscured by the movie's style. You really do not get a good view of the action, but still looks beautiful. Sammo Hung was the action choreographer and that occasionally shines through, but for the most part, Wong Kar Wai overshadows Hung with his own editing and pacing. You catch glimpses of Hung's brilliance, but that isn't really the focus or the point. This is wuxia painted with an impressionist's brush. I think it works for what Ashes of Time tries to do. The film itself is gorgeous. I haven't seen the original 1994 version, but from what others have told me, the new score gives it a much less dated feel. The look and the sound drew me in and held me captive from beginning to end. In terms of gameability for a campaign, I don't think there is a lot here to extract. The story is too vague and abstract, the locations too amorphous to really glean anything for an adventure. There is certainly mood and atmosphere. I think you could incorporate that to a degree. The characters themselves might serve as inspiration for NPCs, but honestly you would be better off just pulling from The Legend of Condor Heroes directly. This isn't a movie that everyone will enjoy. It is short on action, it is hazy, confusing and highly ambiguous. If you do enjoy it, it certainly warrants a second or third viewing. Ashes of Time normally isn't the kind of film I like. 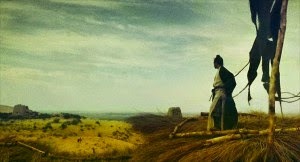 I love wuxia, but I am not that into films that deal with high concepts or are overly rich in symbolism. But I connected early on because the look was mesmerizing and enough of it made sense that I found myself thinking about what it all meant in the days that followed. That said, I still feel like I never quite grasped the underlying message, like I missed something important (but that just makes me want to watch it again). Brilliant thorough review of a film I found confusing yet poignant. Thanks Geordie. Definitely a strange film.